The Law Commission’s Consultation on Automated Vehicles – Does the road to success on regulation signal the end of the “driver”? Manufacturers, academics, technology experts, insurers and law firms have all been busy at the start of 2019 working through the 46 questions included in the Law Commission’s preliminary consultation paper. The consultation is the start of a far-reaching review of the UK legal framework for automated vehicles (AVs). The rapid developments in AV technology we have seen since the VENTURER project started in 2015 have posed many questions surrounding the legal framework that underpins their deployment on public highways. One of the crucial gaps in regulation originates from the fact that many existing requirements apply to human drivers. As we know from VENTURER’s work, once the technology develops to SAE Levels 4 and 5, humans will increasingly cease to be the drivers of our cars. When that happens, what do human occupants of vehicles become and what are they legally responsible for, especially when things go wrong? The Law Commission has proposed to address the problem of the ‘driver’ by developing the term into a new concept: the “user in charge”. When would the user in charge replace the driver? Path 1 (SAE level 4) vehicles will have identifiable human ‘drivers’, which are then able to increasingly cede control to the automated driving system. For these vehicles, the journey would likely see the AV operate in both automated and non-automated mode. For the non-automated aspects, a driver would be required. An example may be a vehicle that can operate in automated mode on a motorway, but once leaving the motorway a human driver would take over after a clear handover process. For these “highly automated vehicles” the term ‘user in charge’ would be used to replace the term ‘driver’. Path 2 (SAE level 5) includes vehicles which can self-drive all aspects of the journey with the human occupant acting as a passenger. For these AVs, the term ‘user in charge’ would not be used. The term ‘user in charge’ would also exclude vehicles with advanced driver assistance systems (SAE level 2) and conditionally automated vehicles (SAE level 3). Although these systems often give the impression the vehicle is self-driving, the need to be receptive to either the driving scenario or any requests to intervene to ensure safety means a driver is always required to remain responsible for the driving task. What is the user in charge? As a user in charge would be required to drive whilst the path 1 vehicle is in non-automated mode, either due to a planned handover or an AV performing a minimal risk manoeuvre, it is necessary that the user in charge is qualified and fit to drive. However, when the vehicle is in automated mode, the user in charge would not be responsible for any civil or criminal liabilities that we would currently associate with the ‘driver’ of conventional vehicles such as if the vehicle broke the speed limit. In the automated scenario it has also been suggested that the user in charge would be able to undertake secondary activities, such as checking emails on the morning commute. The Law Commission also suggests that the user in charge would have the responsibility of insuring and maintaining the vehicle, complying with police or traffic officers and carrying out the same duties following an accident that the current law describes for a conventional ‘driver’. The Commission has methodologically unpacked the crucial issues surrounding the responsibilities of the user in charge, such as ensuring the vehicle is insured and maintained. A broader point that must be addressed is that as we extend the law to incorporate AVs more readily, lines of responsibility must not be blurred to ensure the safe deployment and consumer acceptance of AVs. Provided the legal framework can safeguard this, the concept will be welcomed. The consultation even asks for a response on the appropriateness of the name ‘user in charge’. Although it may seem a trivial point, this label will eventually be an important element of motoring. Ensuring the term is distinctive from a ‘driver’ and can be communicated easily to consumers will be crucial. It is arguable that the term ‘user in charge’ may be confusing for consumers as when the vehicle is in automated mode they may not necessarily feel ‘in charge’ of the vehicle. The naming of this role will be a constant theme as the Commission’s review continues. Creating the legal and regulatory framework of AVs is only one element of this process; the second involves ensuring that any new or amended framework is sufficiently communicated to motorists. Failure to provide sufficient consumer education on how AVs impact the road safety regime, changes to any legal and regulatory responsibilities and the technical aspects of the equipment, will ultimately jeopardise the safe deployment of AVs. 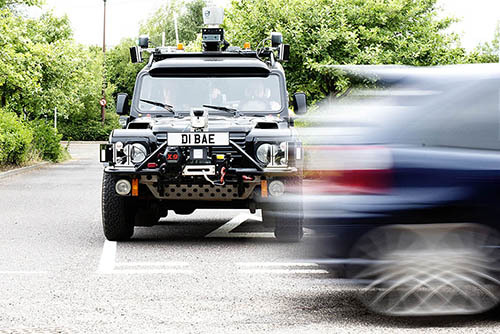 The joint consultation by the Scottish Law Commission and the Law Commission of England & Wales is part of a three-year project running from March 2018 to March 2021, which will look at all aspects of the legal framework for AVs to provide recommendations for government. Authored by Sophie Bonnel and Jonathon Murphy at AXA UK, and Lucy Pegler and Brian Wong at Burges Salmon.